great debate. loved your talk, thanks for posting it here too. I've linked to your talk, which think excellent. Thank you. "There is relatively little fiction and poetry online, by which I mean, fiction and poetry that is native to that environment, written with the intention of being read there." Um… you've never heard of fanfiction, have you? Hi, Jacqueline: I can't claim to have read much fan fiction, but I feel as if I've been reading academic papers about it since I was an undergrad, which was longer ago than I care to remember. During the question-and-answer period at the n+1 panel itself, another of the panelists, Mark Greif, also brought up the question of fan fiction. In terms of sheer numbers, I don't think the example gives me the lie: I'm only claiming, after all, that there's relatively little fiction online, compared to the proportions in the off-line world. I'm not claiming there's none. Statistics? Otherwise, what reason to trust? I'll tell you what I wonder: Who are you? Why aren't there any links? Is anyone else reading this? Thanks for posting this, Mr. Crain — truly thought provoking stuff and a great reminder of the pleasures of offline reading/writing. 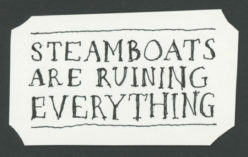 When you have a chance check out my posts discussing these themes at http://eclecticdialectics.blogspot.com/2008/06/steamboats-indeed.html. Cheers and thanks again! Antrastan: Trust no one! As I admitted in the talk itself, it's "impressionistic and subjective." KBO'R: I ask myself such questions hourly. I have finally started Sweet Grafton, which has put me in mind of your concerns about belonging and groupiness. There isn't much pleasure in feeling excluded by a work of fiction – almost, in fact, as if it's a bizarre sort of IQ test. However, I will persist. Oh no, don't "persist"! It isn't meant to be difficult, so perhaps it's just not your cup of tea. Statistics: On fanfiction.net alone, there are 361,224 stories based on the Harry Potter universe, many of them 20,000 to 50,000 words (80-200 pages) in length. Taking 5,000 words as an average, that would be the equivalent of 36,000 books of 200 pages in length. That's one type of story on one website. No, Caleb, then the fault is mine – trying to read in too much. And I want to persist, since I've been convinced by your blogging that you write well. This is a brilliant, not to say beautiful, description of the nature and effects of a particular online literary style, but I cannot agree, as you seem to be implying, that it is changing the way good writers write. Do you really think that a particular style of writing generated by online communication is poised to destroy a centuries-old tradition of elegant, trenchant writing of which one example is, if I may be allowed a moment of toadying, this essay? Tilda: Thanks for the kind words. Maybe not destroy entirely. But maybe every medium shapes its messages? Excellent essay. In his "Narrative Design," Madison Smartt Bell describes fiction as improvisation done in solitude and in advance of the audience's experience of it. This makes it unique, he argues. With the internet, of course, the time between that improvisation and the presentation has been collapsed. And so with, perhaps, other aspects have collapsed as well. Put in those terms, I have to wonder if the single most important difference with the internet is the temporal difference(which is attended, as always, by spatial differences and, in turn, social ones as well). The question that I wonder about, really, is whether or not the internet will change the way people right for print. For many of the reasons you mention, I do think that the future of the book is secure. But what of its content? It's an impossible question, of course. But still fun. This is a wonderful essay, and I think everything you said was spot on. Reading it I felt like I was reading a William James lecture; it made me sad that I missed the lecture. If I can flatter you some more, it's good that there are writers like you on the internet (and in N+1, I sometimes think you're the voice of reason over there). So how'd you get to be so smart? Well, that’s news. I didn’t know of the disproportionate representation on the internet for fiction and poetry. I couldn’t wait; I jumped over and googled “news” and got 3.95 billion hits while “fiction” and “poetry” got 197 million and 168 million hits respectively. Other googling got the following hits: “politics”/425 million, “opinion”/411 million, “novel”/197 million, and “short story” got only 18.5 million hits. While in no way is this bit of googling results a scientific evaluation, still, it confirms the phenomena you mentioned that I didn’t know existed, and I get on the interest almost every day. I didn’t know the internet was a real world exercise. I wonder if we ever get an interface more personal than a personal computer, such as a book, fiction will make the same presents it has in publication or even the book store. I blog or comment (as here) because in my tiny little mind, I am being published. While I could never keep a log or journal no matter how many times I started one, blogging is way different. And it’s the exercise not the content − although I do have a “good day” when I can turn a phrase. When I discovered that writing is like playing music or running a marathon and not something you do when you suddenly have something to say, I knew I needed to write regularly − even if I had nothing much to say, which is confirmed by my blog. So, under the general rules of the Web, it's difficult to read or write fiction. Let's entertain the idea that there is a subset of rules which make it possible for a relatively small, but (I was trying to say) significant number of people to read and write fiction on the Web. Rule 1: It helps to have a work computer vs. a home computer, one to do work on and one to fool around on. I do, and I do. Rule 2: It helps to belong to a social network. Then you don't have to worry about people getting bored and leaving the site. They won't; they're fans. Well written article with excellent content. It does, however, not speak to the primary reasons why people do not read fiction or poetry online. That is, it does not speak to the limitations of the media as a method for reading text. Low resolution computer monitors create stress and tension that force online browsers to scan rather than read text. (See Poynter Eye Tracking Movement Studies at poynter.org). Essentially, it is damn uncomfortable to read lengthy text online. Next Next post: All this poor dog wants . . .